ROSCO, a.k.a. Ross Shakespeare, is a versatile musician who plays both guitar, bass (both Tomkins of course) and double bass. Ross has lived and worked overseas (Singapore, Hong Kong, Phillipines and Vietnam) and played in everything from jazz trios to big bands. Over the years he has performed and toured with a huge number of overseas and Australian entertainers and musicians (as diverse as Chubby Checker to James Morrison). He is well known in the Sydney club scene and for many years played at Ryde Eastwood Leagues Club. Ross is currently completing a 'smooth jazz guitar CD with a Brazilian and fusion flavour'. Canefield Seas is the track by Rosco that appears on the Tomkins Showcase Volume One CD. It was written, arranged,sequenced and recorded by Ross Shakespeare at MusicSpace Studio on 8th August, 2002. The guitar was played live as one take direct-to-disc with no overdubs. 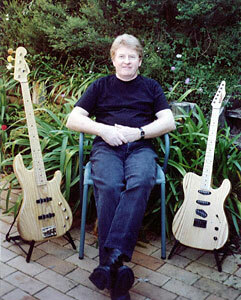 Tomkins guitar s/n 0025, Tomkins bass s/n 0003.